An interview with the author of ‘The Shadows of Darkness’. · 1: What was your favorite chapter (or part) to write and why? There are a few portions of the book that stands out specifically to me. Like Diya and Sejal friendship, when Maya talks to Sejal giving out the details of the night happened thirteen years ago, how Sejal deals with a molester in the cafe, Muthu’s story, Sarojini drawing strength from her loneliness, Kavita, an encounter with Kartik each time Sejal meets him, their growing chemistry etc. My favourite parts, however, are two. One, the evening where the past comes back to avenge itself; the way Sejal struggles throughout, it is spine-chilling and captivating! It glues you to the seat. Second would be the climax, the way book has managed to give away the message – Create a meaningful life despite failures and disappointments. It’s very inspirational and powerful, even to me, its creator. · 2: What inspires you to write? · 3: How long does it take you to write a book? It’s a tricky question since each book has its own demands to work upon. My first book, It’s Never Too Late, took almost a year and a half to get published. I had to put myself in Maya’s shoes to be able to understand her the way story demanded. Creating a perfect life for her, turning into a nightmare and then showcasing the aftermaths, none of it was easy, especially when you are making a debut. The latest, The Shadow of Darkness, took almost 4 years to come out. A lot of research and in depth knowledge has gone into it. This time the challenge was bigger – Childhood trauma and how to express its power on the person in tiny ways – because it is a subject hardly talked about. I was needed to portray so many things in such a way that it turns out to be a smooth narration. From friendship to family, misunderstandings to romance, revenge to resuscitate, all of it was a challenge in itself. But I enjoyed all of it! Had the book been published before, it wouldn’t be in its perfect form, as it is today. · 4: How did publishing your first book change your process of writing? The publication of It’s Never Too Late and readers’ adulation instilled the belief that I can write further and that changed me as a first-time naive writer to a harder working evolved storyteller. It provoked me to become better and offer different each time I pick my pen. · 5: What are common traps for aspiring writers? There is no job that doesn’t have any challenge involved! The climax of The Shadow of Darkness was difficult, not in terms on deciding but how to put it across. It tells you to embrace failures and disappointments and create some meaning in life. Where Maya was the winner in my first book, on the contrary, The Shadow of Darkness has seen Sejal going down, plunging in such depth of darkness that if it wasn’t for love and willingness from her side, she’d probably never come out of it. Where Maya had to fight the repercussions of the torturous night, Sejal is pitted against herself. How can you win over yourself, it’s a million dollar question. The idea was easy but designing had taken quite some time. Another big challenge that I have been facing in recent times is to moving countries. The Shadow of Darkness was written in India whereas it got published when I am in Kuwait. Changing countries is confusing. You have to really sit down and think how you can manage to write, promote as well as settle now in not one but two countries. I am trying my best though. · 6: Do you have a set schedule for writing, or are you one of those who write only when they feel inspired? The only discipline I know is that I have to write every day. That’s all. I have never been a follower of a time chart. I manage my chores according to my writings or sometimes it’s vice versa and when I set down to work, I always get my job done. Well, almost always. · 7: Do you set a plot or prefer going wherever an idea takes you? The outline is always ready. It’s the little details that shift. · 8: Do you recall the first ever book/novel you read? Yes. 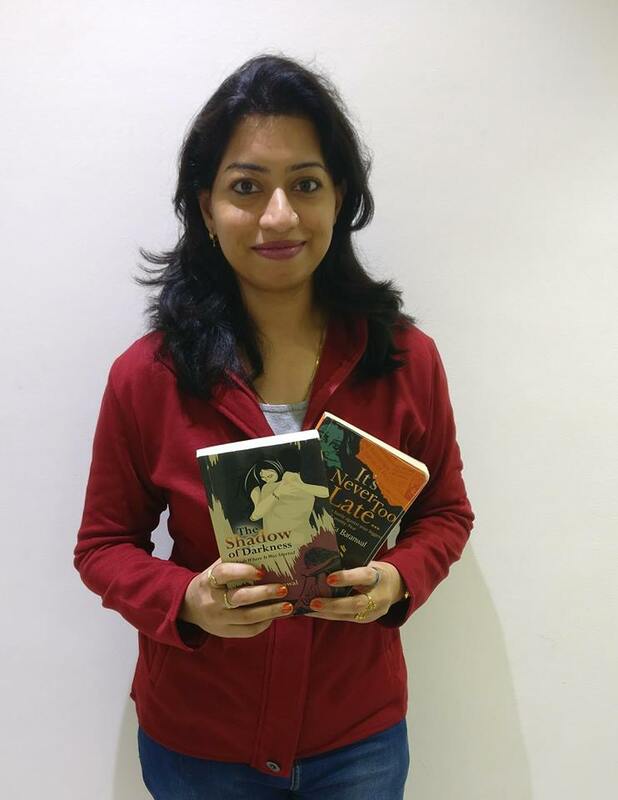 It was Mayapuri from the esteemed Hindi author, Shivani. It was probably 15 or 16 years ago. I totally loved it! Shivani had that rare edge toward bringing her characters very alive! She can easily make you feel their pain, pleasure, desires, aggression, agony, intimacies and complexities of their relationships. Her female protagonists are so magnificent in their own ways that you’d want to become like them. Her writing is highly inspirational. No wonder I have a good collection of Shivani’s novels in my bookcase. Sadly, she is no more between us to give good stories anymore. · 9: If you were to change your genre, which one would you choose? So far, I am content with my genres which are – thriller, motivational/inspirational, fiction, bit of romance, relationships – you can see I have quite a variation in my writings. But I’d certainly like to try Humor. It is a very very challenging and one of the most loved genres. 1 10: What does literary success look like to you? To achieve what you dream. · 11: What are your hobbies, passion other than writing? A few. Playing my guitar, travelling, jogging, reading, sitting quietly for as much as I can afford. I hate loud voices or noise. They give me a headache. Read and write, as much as you can.